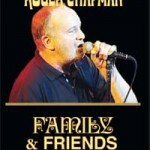 ROGER CHAPMAN shot to fame as lead singer/songwriter with FAMILY in the late 60′s/early 70′s notching up TOP 10 Hit singles and albums . 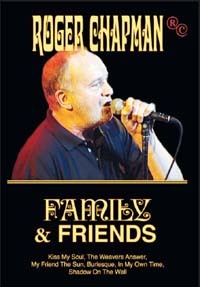 Now Roger Maxwell Chapman will be 60 years old this year and there is perhaps no better time to reflect on his burgeoning back catalogue. In co-operation with the Mystic Audio release Angel Air Waves filmed Roger in concert at a sold out Newcastle Opera House during the opening leg of his UK tour in the autumn of 2002. His Band SHORT LIST support Roger as he trawls through his enormously popular catalogue and provides over 2 hours of classic rock sung and played the “Chappo” way. This concert, recorded late last year at Newcastle's Opera House, features songs throughout his career, right up to current efforts…As you would expect from someone like Chapman, he surrounds himself with the best players around…Chapman, as always, gives a 100% performance. The man's a national treasure. Extras include a frank interview with the man himself and a comprehensive written history of his career to date. This is quite the best Angel Air Waves DVD yet released, even topping the recent Culture Club 20th anniversary concert. It is a warm experience, as if he is playing just for the listener - and the stage is delicately lit. There is nothing flashy, just a man and his voice. As well as a montage of his career, the bonus material also includes a lengthy interview with Roger which provides an insight into just what he is all about. Extras include a frank interview wwith the man himself and a comprehensive written history of his career to date. This is quite the best Angel Air DVD yet releases, even topping the recent Culture Club 20th anniversary concert.